While it’s possible to live with just one type of music file—AAC or MP3, for example—there are a number of different file formats used for music that you’re likely to encounter these days. 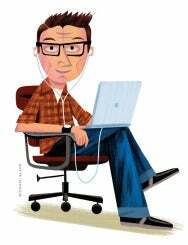 Lossless formats—such as Apple Lossless and FLAC—and high-resolution files can be a challenge for iTunes users. Here are some questions that we’ve received about converting between different file formats. Q: I often purchase high resolution files (88.2 kHz/24 bit, say), and while I can play these files through iTunes and my home stereo system without a problem, I cannot sync them to my iPod or iPhone because these portable devices do not recognize them. How can I create a separate standard resolution (44.1 kHz/16 bit) copy of these files for use in my portable devices within the same iTunes library? 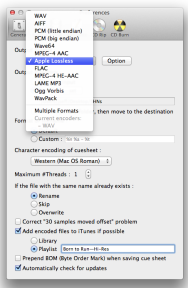 XLD's preferences let you choose conversion formats and add them to iTunes playlists. First, you need to convert the files to a format that is compatible with iPods and iOS devices. I recommend doing this with tmkk’s free X Lossless Decoder (XLD), which is the most versatile tool for converting audio files that I’ve come across. You can convert your high-resolution files to the format of your choice—Apple Lossless, AAC, or MP3—and sync those files to your iOS device. XLD converts files from many formats to many other formats, so you can use it for just about all your conversions. In order to distinguish these files from the high-res files, you have two options. Either create a “High-Res” genre, assuming you have fewer high-resolution files than standard files, or name the albums in such a way to distinguish them. For example, you could have two versions of Bruce Springsteen’s classic album named Born to Run and Born to Run—High-Res. After this, you’ll need to create playlists to segregate the different types of files and sync your content to your iOS devices. In fact, XLD’s preferences let you add converted files to a new playlist of your choosing, so you can easily incorporate playlist building into your conversion process. Q: I import all my music into iTunes in Apple Lossless format. Is there a quality difference if I were to convert an Apple Lossless file to AAC as opposed to importing a CD directly as an AAC? No. A lossless file, by definition, contains the exact same data as the original CD. In fact, many people rip CDs in lossless format to keep archival copies, then covert to AAC or MP3 to use them with portable devices. Q: I want to re-import into iTunes a lot of my CDs that I previously ripped at between 128 kbps and 320 kbps; I’d like to rip them in Apple Lossless format. But these tracks all have custom album art, lyrics, and genres and additional tags in the Comments field. Is there a way to import the new audio files and keep all the non-audio metadata? When using Copy Tag Info Tracks to Tracks, you can check which of the many tags you wish to copy from your old files to the new ones. Yes; there are two ways to do so. First, if you re-rip a CD and the Album, Artist, Genre, and Name tags are the same as what’s in your iTunes library, iTunes will see this and offer to replace the current files with the new rips. When it does so, iTunes keeps all of the additional metadata. However, I’ve found when re-ripping some of my CDs that this doesn’t always work, even if the tags all match. For this reason, I use Doug Adams’ Copy Tag Info Tracks to Tracks AppleScript (payment requested). 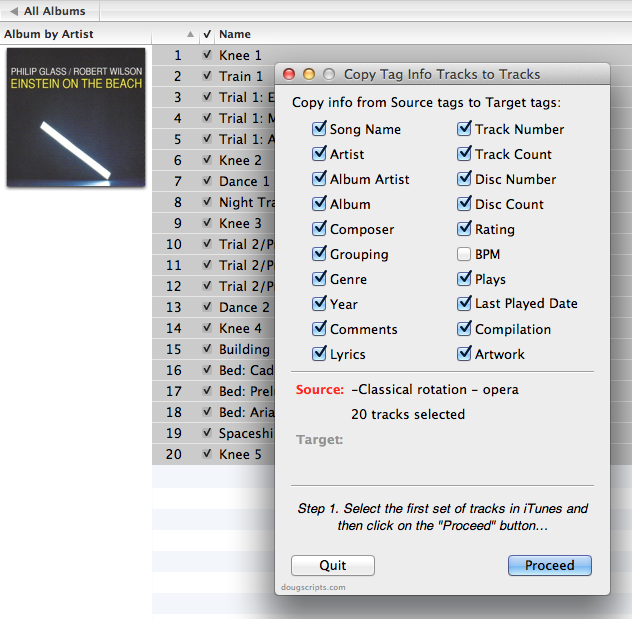 To work with this script, select the first group of tracks—the ones with your custom metadata—then copy this data. Next, select the newly-ripped tracks and paste the data onto them. You can delete the older tracks after you’ve checked that everything got copied correctly. Q: Before the SACD format died in the marketplace, I acquired a number of classical SACD disks. 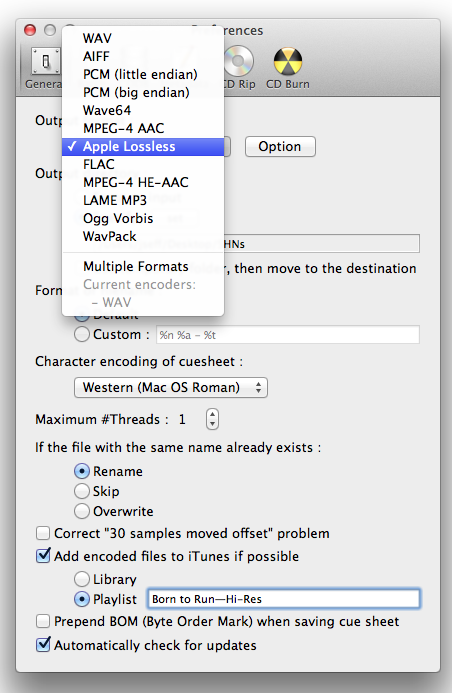 Is there any way to convert SACDs to Apple Lossless format, while maintaining maximum audio quality? The short answer is no. Super Audio CDs, aka SACDs, store audio in a special format called Direct Stream Digital (DSD) that you can only play with devices that support it, which are generally higher-end optical disk players. Optical drives for computers can’t read them, and the DSD stream has copy protection. There is an exception. As you may know, there are many hybrid SACDs; these contain two layers, one with the DSD stream, and the second with standard CD audio. You can rip these discs just like regular CDs, but you won’t get the higher quality of the SACD layer. There is software out there that lets you rip the DSD streams of SACDs, using certain models of Sony PlayStation 3. You might want to do a Google search for it if you’re really curious. By the way, the SACD isn’t dead (yet); there are still a number of classical labels releasing SACDs, and there have even been some recent releases from EMI, suggesting that the market might be hanging on. Q: If I reconvert all of my CDs to Apple lossless, can I get rid of all of my compressed versions or do I need to keep those so that I can play the songs on my iPhone, iPad, and Apple TV? In other words, do the iOS devices and Apple TV play lossless files? 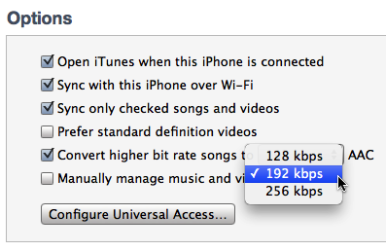 With this iTunes option, you can downsample your music files when you sync them to an iOS device. All of Apple’s current iPods and iOS devices can play Apple Lossless format—although you might not want to do so because of the amount of space those files take up (especially on space-cramped devices like the 2GB iPod shuffle). In a recent Mac OS X Hints blog post, I discussed using iTunes’ auto-convert feature when syncing to iOS devices. So you can fill your iTunes library with lossless files—to listen to through your computer connected to external speakers or on your stereo system via your Apple TV, for example—and let iTunes convert them on the fly, when you sync, so you can store more music or your iPod or iPhone.